Bee Power! Nature’s Miracle Food! Collected from pesticide- and chemical-free fields of lush wildflowers. All-Organic! Non-irradiated! Enzymatically active! Pollen is reported to be the richest food source known. Pollen is rich in all the amino acids, vitamins, minerals and vital trace elements, hormones, carbohydrates, and more than 5000 enzymes and coenzymes necessary for digestion and healing. Remember, a diet deficient in only one nutrient can result in ill health and disease for your pet! The protein content of bee-collected pollen averages 20-25%; half are essential free amino acids (complete proteins). Mineral content averages 2.7%. Dosage: 1-2 tsp/day. Collected from lush fields of wildflowers, this is “Nature’s Miracle Food” at its best! This super-premium HUMAN-GRADE bee pollen provides your pet with vitamins, minerals, over 5,000 enzymes and coenzymes, and more of nature’s bounty that is yet to be identified! What is bee pollen? Bee pollen is the dust-sized male seed of a flower blossom, which collects on the back legs of bees as they move from flower to flower. The honeybee collects pollen and mixes it with its own digestive enzymes. One pollen granule contains from one hundred thousand to five million pollen spores each capable of reproducing its entire species! Bee pollen is one of the oldest food supplements known to mankind, dating back to the early Egyptians and ancient Chinese. Even Hippocrates used it as a healing substance over 2500 years ago! Bee pollen, the food of the young bee, contains all the elements essential to life, elements that act together in synergy and which cannot be synthetically reproduced in laboratories. Why is bee pollen called Nature’s miracle food? Bee pollen contains nearly every known nutrient required for a balanced human diet: 22 amino acids (including eight that are “essential” and therefore must be supplied through the diet), 27 minerals, most of the known vitamins, and many enzymes. It is 35% protein (more protein than in eggs, beef or cheese), 40% carbohydrate, and 5% fat. It lacks only roughage and water for totally complete and balanced human health and nutrition. Pee pollen is also naturally high in B vitamins and is often taken for increased energy and vitality. Bee pollen is considered one of nature’s most completely nourishing foods! Why are enzymes so important? Enzymes control the chemical reactions in the body that are necessary to sustain life. Without enzymes, cells could not function. Things that we take for granted such as being able to metabolize food, having energy, healing, having the ability to digest food, just to name a few, would not be possible without enzymes. Unfortunately, when we cook food, we kill all the enzymes present because enzymes are very heat and light sensitive. Processed foods are devoid of enzymes. 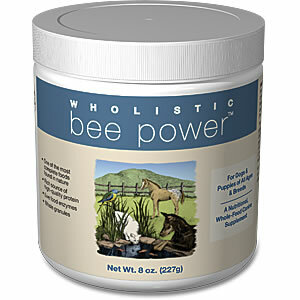 Wholistic Bee Power TM is very rich in live, active enzymes and co-enzymes. Because it is collected from lush fields in the United States and not imported from cheaper sources where product integrity is often compromised through processing and storage, Wholistic Bee Power TM is rich in all valuable nutrients. Are there other uses for bee pollen? Wholistic Bee Power TM is known to strengthen the immune system because of its antioxidant properties. Through normal cell metabolism, free radicals develop in the body. Free radicals are byproducts of cell metabolism that circulate freely in the body looking to bind with other cells. However, upon binding, these free radicals cause degenerative damage and disease. They are especially associated with aging. The antioxidants found in WholisticBee Power TM block free radicals, decreasing the damage and even reversing much of the cell oxidation. Wholistic Bee Power TM also helps counteract the effects of radiation and environmental pollutants that weaken the immune system. Athletes often use bee pollen to help increase their strength, stamina, endurance, energy and speed. Bee pollen has been known to stimulate ovarian function, thereby boosting fertility and increasing egg production. It also increases physical and mental abilities, especially when associated with aging, assists in boosting a sluggish metabolism and thereby assisting in weight loss, and has been known to reduce hay fever and allergies by a process of slow desensitization. Wholistic Bee Power TM is designed for your pet’s health. We think you will agree! Wholistic Bee Power TM is collected from pesticide-free fields in the United States. Much of the Bee Pollen sold in the U.S. is imported from China, where there is little to no quality control or regulations. Testing often shows the bee pollen to be contaminated and to contain little of the active ingredients stated on the label. That is why it is very important to obtain bee pollen that comes from pristine sources. Wholistic Bee Power TM comes from lush fields of wildflowers that are not treated with pesticides or other chemical contaminants. WholisticBee Power TM is also non-irradiated. Your pets deserve the best! Give them Wholistic Bee Power TM Nutritional analysis of this exceptionally dynamic supplement shows that it contains a variety of vitamins, minerals, proteins, carbohydrates and free amino acids. 1-2 Tsp Daily Sprinkled on Food. Ingredients: 100% Organic Bee Pollen. Last week, 827 signatures were presented to the Waukesha County Park representative in favor of a dog park in Mukwonago. He was impressed with the petition and is positive this could happen! A landscape architect will put together a cost/budget so it can be incorporated into the 2013 County budget. At this point it would go to the County Executive for inclusion in the 2013 budget. Fundraising costs would then be presented to share with the community. In early Fall of 2012, local fundraising could begin. Way to go, Pack Members! We will continue to update you all on the progress. Friday the 13th – NOTHING Scary Here! We guarantee your day will be a good one when you stop in the store between the hours of 10am-3pm. Our representative from Stella & Chewy’s will be demonstrating and handing out great coupons. Stop in to learn more about this food made in Milwaukee! Lakeland Animal Shelter is in the store Friday & Saturday this week (January 13th & 14th ) showcasing adoptable dogs & cats. Reduce your heating bills this winter—snuggle up with a new friend to stay warm! Saturday, January 14th our Earthborn Holistic representative will be here from 10am-2pm. Stop in for samples and coupons and to learn more about this line of food. We hope you have enjoyed this beautiful week!